Quirky, interesting without trying too hard to be, beautifully drawn. It felt a little short, though my own subjective need for more might be to blame for that. It's an interesting take on the genre, the characters featured are compelling and the tale is intriguing. It's definitely worth a read. 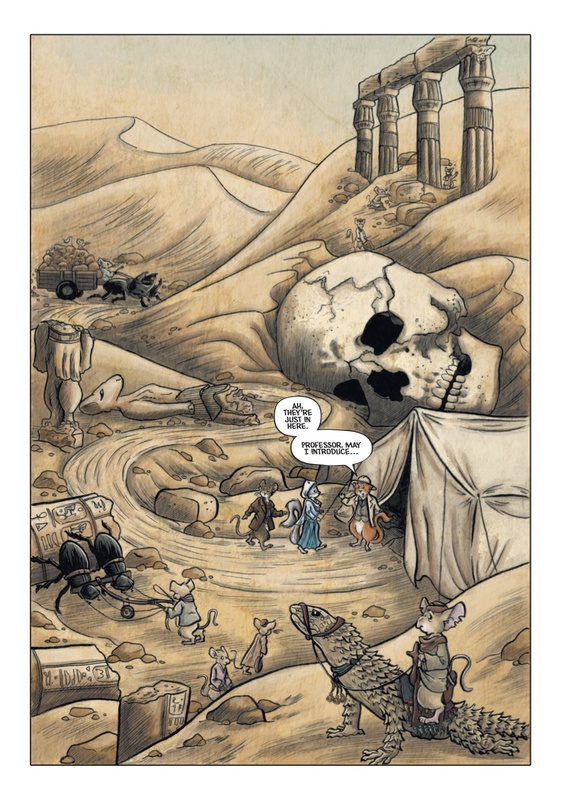 MULP: Sceptre of the Sun is described, in the words of its creators (Matt Gibbs and Sara Dunkerton), as an anthropomorphic adventure, set in the world of mice. I expected something entirely different, given this description – perhaps something more child oriented, accessible to adults, but holding less interest for them – so I found myself pleasantly surprised to discover that the tale was still riveting and suited for all ages, despite its furry protagonists. The storyline seems simple (though I’m suspecting the authors might have a few surprises in store for us as the characters develop and the story evolves). We have an ancient artefact, discovered in Egypt, that might lead to a hidden treasure and of course, once the word treasure is uttered, everyone develops a sudden interest. Our heroes: Jack Redpath, Vicky Jones, Cornelius Field and the Harvest-Scott family are set to stop the evil mice from getting their paws on the treasure, though it’s proving to be quite a dangerous adventure for them all, given the unscrupulous nature of the bad guys/mice. Betrayal, double-crossing, kidnapping and deception are things that abound in the story, yet the way they are brought to life on the page keeps it from becoming too dark. The first issue of the comic sets the stage for the following adventures, explaining how the mice world came to be, at least from a mythological point of view, as well as giving us a small glimpse into the reasons behind the development of their anthropomorphic society, with humanity being nowhere to be found. I liked the authors’ take on the classic myths as well as the way they managed to stay true to the nature of their heroes. There were no slip ups, everything was suited to a society ruled by mice, from the pyramids where every god depicted was a mouse, to the scale of the world surrounding them and the way they addressed each other as gentlemice. There was a certain sense of realism (however silly that might sound) and the fact that even the smallest detail wasn’t forgotten, proves that this story has been well thought out before pen met paper. One thing that caught my eye from the first page (other than Acorn Airways, which instantly hooked me), was the attention to detail when it came to the design of the characters. There are no two mice alike, even if they are nothing more than background characters. Each has its own distinguishing features, despite them belonging to the same “mice” family. I mentioned the attention to detail already, the fact that it’s obviously something they’ve given a lot of thought about and all I can add is that I love the way they’ve managed to make the story come to life, every panel seamlessly moving to the next one. The art is beautiful and the colours are fantastic, keeping with the tone of the tale. Kudos Sara Dunkerton! MULP: Sceptre of the Sun is a fantastic read, one that kept me interested with each page and that made me slightly frustrated as I realized that I have to wait for issue number two for quite a while. The comic will be available come May 7th, all information about the venues where you can purchase or pre-order it being available on their official website: http://mulpcomic.com/ I strongly suggest you get your tiny “paws” on it and give it a shot, you won’t be disappointed.